I travel a lot for work and often find myself in airports and in unfamiliar cities wondering where and what I can eat that will fill me up, not out. Since eating out makes it harder to keep your daily calories in check, you have to learn how to dodge the calorie minefields in restaurant menus. As a nation, our appetite for eating out seems to be insatiable. According to the National Restaurant Association, nearly half of total U.S. food dollars are spent on restaurant food. And a recent Harris Interactive survey of adults reported that 90 percent of adults dined out in the past month. But eating out comes at a high calorie cost. In fact, USDA calculations suggest that eating out just one meal a week could equal two pounds gained in a year! I travel a lot for work and often find myself in airports and in unfamiliar cities wondering where and what I can eat that will fill me up, not out. Since eating out makes it harder to keep your daily calories in check, you have to learn how to dodge the calorie minefields in restaurant menus. That's not as easy as it sounds because in some cases, what seems like "lighter" fare like salads, turkey sandwiches or soups can have more calories than a burger. The good news is that most restaurant chains -- from coffee shops to burger joints -- have better-for-you options and almost all of them have nutrition information (although it's not yet legally required in all states) readily available. Another lesser-known fact is that almost all chain restaurants will customize an order for you, so go ahead and ask for your burger to be wrapped in lettuce, or hold the calorific add-ons like dressings and creamy sauces. When I'm eating out, I try to make my choices add up to no more than 500 calories. I also want to have at least 20 grams of protein and a serving of fruit or veggies, and for the food to be made with fresh ingredients. Some of my go-tos: burrito bowls with grilled chicken and veggies from quick-casual Mexican restaurants, veggie omelets from diners, burgers or grilled chicken sandwiches in lettuce (no bun) at fast-food joints. For more ideas on how to order fast food that's not necessarily fat food, here's what what some of the nation's top nutrition pros order when they're eating out at chain restaurants. "I order the Veggie Delite six-inch sub on nine-grain wheat. I like it because it's fresh, fast, and a filling but not-too-heavy lunch. I add on American cheese, black olives, cucumbers, lettuce, tomatoes, spinach, guacamole, and a little bit of honey-mustard dressing. This totals 360 calories, seven grams of fiber, 630mg sodium. Sometimes I'll add Baked Lay's and my order is still less than 500 calories." "I eat half of it and take off the extra dressing. It's made with grilled eggplant, roasted red peppers and onions so it is really veggie packed." "I make my salad with lettuce, black beans, fajita veggies, tomato salsa, corn salsa and guacamole. I love Chipotle's food with integrity philosophy and fresh, high-quality ingredients. Plus this meal is delicious, and the combo of ingredients leaves me feeling full and satisfied, but not stuffed or sluggish. And the nutrition facts are impressive: 400 calories, two grams of saturated fat, 23 grams of fiber, 15 grams of protein." 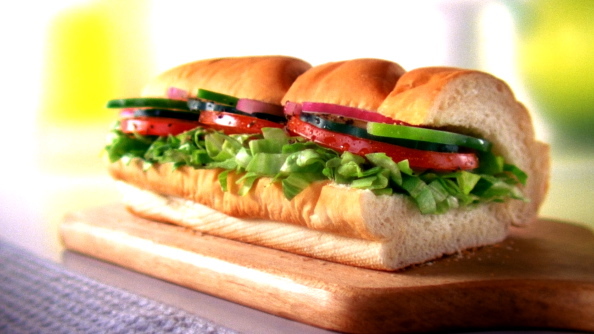 "I get this on a whole-grain bun with lettuce, tomato -- really delicious for 310 calories! My other go-to fast food item is McDonald's Egg McMuffin. 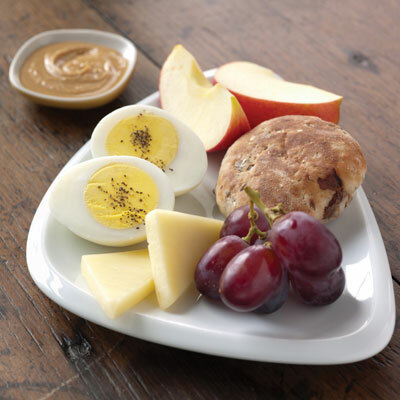 The combination of 18 grams protein and four grams fiber is super satisfying for 300 calories." "For lunch if I need to eat out I can get a protein bistro box from Starbucks for 380 calories, 13 grams of protein, 37 grams of carbs and five grams of fiber. For dinner, I like Qdoba bowl made with grilled chicken, beans, fajita veggies, lettuce, cheese and salsa for 350 calories. "I'll order this without cheese. These have less than 300 calories and 16 grams of protein and three grams of fiber." "My fillings include black beans, fajita veggies, tomatillo-green chili salsa, fresh tomato salsa, and guacamole. No sides are required... it's a truly tasty meal in one. Though I'm hoping they offer whole-grain tortillas soon." "Being a diehard New Yorker, one slice of cheese pizza is one of my favorite on-the-go eats. If you get pizza with a thin crust and not piled high with high-fat add-ons, it will generally be less than 300 calories a slice." For more by Julie Upton, click here.